The URV attended NAJAH Abu Dhabi to publicise its Bachelor’s Degree in Chemistry taught in English and master’s and doctoral courses. 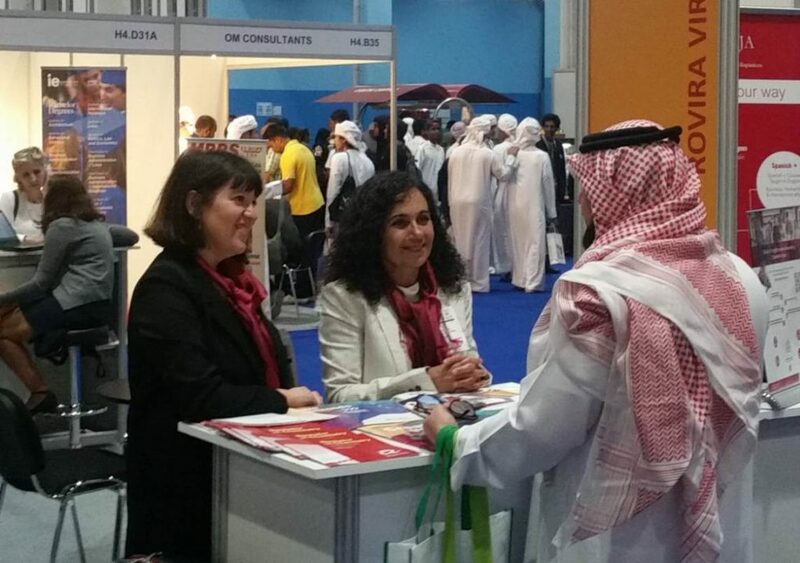 NAJAH Abu Dhabi has taken place at the Abu Dhabi National Exhibition Centre (ADNEC) in the capital of the United Arab Emirates and was attended by 162 local and international higher education institutions from more than 20 countries. The fair is aimed at future students who are interested in signing up for a bachelor’s degree course. The URV participated in the fair for the second consecutive year, this time under the auspices of “Study in Spain”, organised by the Spanish Service for the Internationalisation of Education (SEPIE). From 31 October to 2 November, Mar Reguero, professor in the Department of Physical and Inorganic Chemistry at the URV’s Faculty of Chemistry, and Alba Medina, recruitment officer from the Master’s Support Office (OAM), provided the public with information on the courses offered by the URV, in particular its Bachelor’s Degree in Chemistry taught in English. After inaugurating this bachelor’s degree in the 2017-18 academic year, the Faculty of Chemistry identified the United Arab Emirates as a potential source of students for the programme. The URV’s Bachelor’s Degree in Chemistry has been rated as ‘excellent’ by the Spanish University Quality Agency (AQU) and is intended to meet the growing demand for professional chemists with a high level of English. Students interested in signing up for the course for the 2019-20 academic year can pre-register with the Catalan Government independently of the Bachelor’s Degree in Chemistry taught in Catalan and Spanish. The Faculty of Chemistry also works to attract students from other countries. The URV delegation completed its visit to the United Arab Emirates with two visits to international schools in Dubai and meetings with tutors, professors and students. It also met local organisations that promote graduate mobility and training abroad. These visits were organised by the ICEX (Spanish Institute for Foreign Trade) through its Economic and Commercial Office in Dubai.